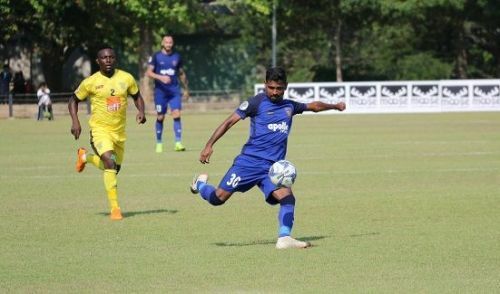 Colombo: Indian Super League side Chennaiyin FC played out a 0-0 draw with Sri Lanka's Colombo FC in their AFC Cup debut in the 2019 edition's qualifying playoff first leg at the Race Course Ground on Wednesday. It was a closely contested affair with chances at a premium for both sides on a humid afternoon in Colombo. The second leg of the qualifying playoff will be contested at The Arena by TransStadia in Ahmedabad a week later on Wednesday, March 13, 2019 at 7:30 PM with all to play for. "It was a tough game as we had expected. We didn't get the away goal we were hoping to get but we managed to keep a clean sheet. It's all to play for in the second leg in one week's time," commented Chennaiyin FC Head Coach John Gregory post-match. Chennaiyin became the first ISL side to qualify for the AFC Cup after having won the 2017-18 ISL title. There were two changes to the Chennaiyin side that concluded their 2018-19 ISL campaign against FC Goa last week. Midfielder Germanpreet Singh came in for Australian Chris Herd who missed out due to illness, while Francisco Fernandes replaced CK Vineeth, who started from the bench. After a tepid opening few minutes, the game's first real chance fell to Chennaiyin's Francis on the right, whose shot from distance following a chest-down from striker Jeje Lalpekhlua went just wide. Colombo midfielder Yapo Momas had a pop from outside the box shortly after, with Chennaiyin keeper Karanjit Singh scrambling. Jeje held up play well upfront as Chennaiyin enjoyed majority of the possession in the first period. Francis and Isaac were willing outlets on the flanks with Raphael Augusto and Anirudh Thapa pulling the strings in midfield. For Colombo, Mohamed Aakib led the line with Cameroonian Tagne Dimitri and Mohamad Fasal on the wings as Ivory Coast man Yapo Momas played in behind the forward line. With half hour gone, the referee called for a water break given the hot and humid conditions in Colombo. After the water break, Chennaiyin rode out a short spell of Colombo pressure and started building attacks of their own. Both sides were unable to find the telling pass in the final third as the first half finished goalless. The second half began much like the first as both teams found it difficult to get going. Thapa and Raphael continued to keep the ball in midfield but the incisive pass in the final third was lacking. Colombo made the first change of the afternoon just past the hour mark as Zarwan Johar replaced Afeel Mohamed in midfield. With the last quarter of the match to go, Colombo drew a sharp save out of Karanjit with a fizzed in cross from the left. The Chennaiyin custodian did well to parry it away from goal. Chennaiyin made two quick changes shortly after as Thoi Singh and CK Vineeth replaced Isaac Vanmalsawma and Francis respectively. Colombo also brought on Buddika Perera for Mohamed Aakib upfront. Thoi's and Vineeth's introduction injected some urgency in the Chennaiyin forward line with half chances falling the substitutes' way, but to no avail. Dimitri then made a surging run on the right flank for Colombo with a minute of normal time left, his eventual shot looping just above Karanjit's goal. Striker Mohammed Rafi came on for Jeje in the final minutes as Chennaiyin pushed for the winner, but Colombo held on as it finished 0-0.